We’d love your help. Let us know what’s wrong with this preview of The Mind and Heart of the Negotiator by Leigh L. Thompson. 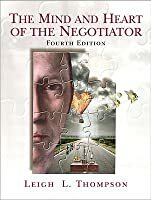 This work takes a social-psychological approach to negotiation. 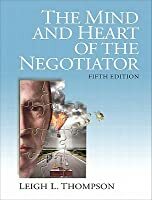 It aims to provide the reader with the tools for understanding both the basics and complexities of negotiation. The book also combines principles, theories, applications, and research. 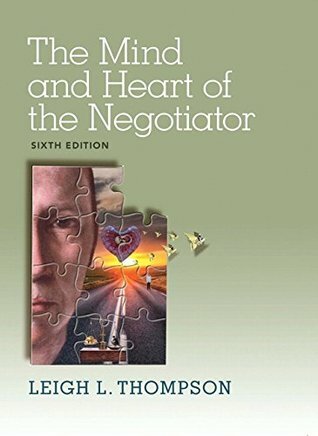 To ask other readers questions about The Mind and Heart of the Negotiator, please sign up. An amazingly useful book, both for professional and personal life. Desde Leader Summaries recomendamos la lectura del libro La mente y el corazón del negociador, de Leigh Thompson. Las personas interesadas en las siguientes temáticas lo encontrarán práctico y útil: habilidades directivas, negociar con eficacia. Es un libro muy interesante para conocer los conceptos básicos en una negociación como qué es el BATNA o la ZOPA. Se presentan ejemplos de estrategias de negociación no convencional y cómo evitar los errores más flagrantes propios de personas no versadas en negociaciones difíciles. Covers a large area of negotiations. I don't agree completely with face to face being the best - given time factors its almost impossible if that is your job (like it is mine). I would not complete more than 25% of what I do now if I had to meet with everyone. It also changes the dynamics which is not necessarily a good thing. A good supplement to my Negotiation class. I got more out of the hands-on practice sessions than reading the book, although the book actually warns the reader in the introduction that practice sessions would be needed. 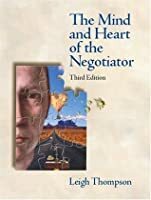 This is the best book I've read on the subject of negotiations. Really helped me realize that negotiations don't have to be a zero-sum transaction. Digs much deeper than surface level negotiation tactics. Impressive, simple to read and understand. Overall a very informative book. However, lots of the material repeated itself and most if it was fairly common sense. But again, overall, I'm glad I read it. A textbook for a negotiation class. Well written and very textbook.